This lockable container is able to hold most manual or automatic shut-off 1" nozzles. The Nozzle Box prevents fuel leaking in the box and helps protect the environment as well as minimizing fuel theft. The Suction Tube with Emergency Valve incorporate a break-away pump mount with a suction tube and Emergency Valve. This tube minimizes fuel loss in the event of a rollover. 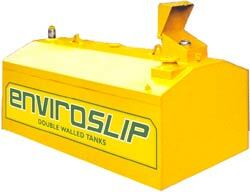 The Suction Tube with Emergency Valve is standard with any Enviroslip slip tank (IBC) but is an excellent addition to any tanks you presently use for transporting fuel.